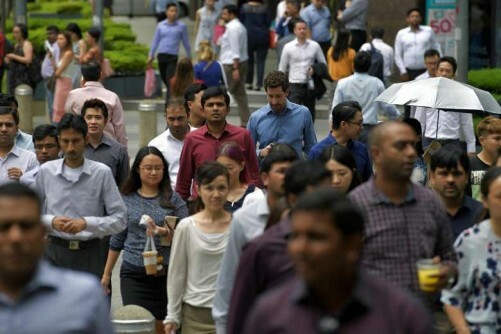 SINGAPORE - Professionals, managers, executives and technicians (PMETs) looking to switch careers in a more uncertain economy will get more help. The Professional Conversion Programme (PCP) to help PMETs switch sectors and jobs will be beefed up, Manpower Minister Lim Swee Say told Parliament on Monday (March 6) during the debate onthe ministry's annual budget. The programme will continue to subsidise 70 per cent of the monthly pay of those undergoing career conversion, but the subsidy cap will be raised from $2,000 to $4,000 a month. This means that the programme can support employers who hire the PMETs at $5,700 a month, said Mr Lim. Employers who hire those who are 40 years and older or those who have been unemployed for more than six months will get a higher level of subsidy. They will receive a 90 per cent subsidy of the monthly pay at a higher cap of $6,000, up from $4,000 a month. "At 90 per cent wage support, we can now support mid-level jobs up to $6,700 of salary," Mr Lim said. The enhancements to the programme were among a slew of measures announced by Mr Lim to help workers find jobs and equip them with the skills to do them, what he called measures to address "job mismatches" - where jobs are available but workers lack the skills to do them - as well as "missed matches" - where workers have the skills and the jobs are available, but "they just have yet to find each other", said Mr Lim. - A Work Trial programme where workers can try a new job for a period of time will be extended from two weeks to three months. - A new Attach and Train programme where workers can join companies for training attachments without the firms having to hire them. The trainees will receive training allowances amounting to between 50 and 70 per cent of salaries for the jobs they are being trained in, capped at $4,000 a month. Finance Minister Heng Swee Keat announced the programme in his Budget speech, and on Monday, Mr Lim announced that the programme will be piloted in the logistics sector. Other industries being considered for Attach and Train programme include the infocomm, healthcare and biologics sectors that are projected to see growth in the future. - Employers who hire retrenched older PMETs (aged 40 and above) or those who have been unemployed for more than one year will get higher wage subsidies under enhancements to the Career Support Programme. The salary support will also be extended from 12 to 18 months, and translates to up to $42,000 over 18 months. - PMETs aged 40 to 49 who are made redundant or are unemployed for six months will get wage support doubled, up to $25,200 over 12 months. - The Career Support Programme will be extended to all PMETs who are unemployed for six months or more, regardless of age or whether they were laid off. This translates to a maximum of $12,600 over 12 months for PMETs under 40. - The minimum salary of workers for companies to join the Career Support Programme will be lowered from $4,000 to $3,600 per month for small- and medium sized enterprises, so they can also take part in the scheme. - The government will hire two foreign employment agencies to help PMETs find jobs, These agencies have experience working with governments in the UK and Australia. - The government-run National Jobs Bank will become a one-stop jobs and skills online portal, with more self-help tools for users.